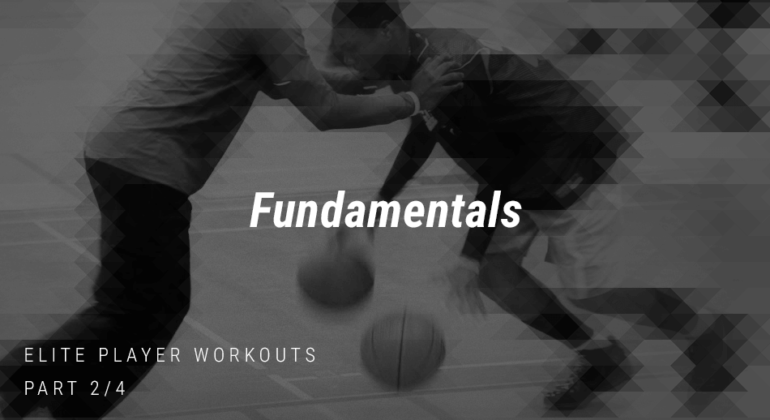 This is part 2 of 4 in our series: Elite Player Workouts. Note: Perform all dribble series while being on the move. Progress through the below dribbles working from basic to intermediate to advanced. Note: Reference the diagram to see the placement of cones on the court. Attack each cone with a strong setup dribble. At each cone, you will make an offensive move to get by your defender (cone). After you attack the last cone explode to the basket for a finish at the rim. Note: Concentrate on passing with both hands by using your wrist and thumbs. Hands/fingers will feel this if doing the drill properly. Set 1: 10 chest/10 bounce passes from 15 Ft.
Set 2: 10 chest/10 bounce/10 overhead passes from 30 ft.
Set 3: 5 chest/5 bounce/15 overhead passes from 45 ft. Note: This drill is designed to build hand strength, make you uncomfortable and improve your overall passing skills. Drill: Pound dribble the basketball into an outside hand push pass. Place cones on either the 5 or 7 spots on the floor, dribble with either R or L hand around each cone finishing at the rim with one of these lay-ups from each spot: Regular, Inside Hand, Strong Hand, Power (2-foot finish), Reverse, Weak Hand. Challenge yourself by staggering the cones in a zigzag formation to work on dribble moves into the various finished at the basket! This is part 2 in a series of posts put together to help you become an elite player, including a bonus section to ensure you get the most out of your time in the gym. Great players and great teams do more than what’s required, love to be coached, accept criticism, master the fundamentals and are passionate about practice!